The Cat Fanciers Association accepts the Havana Brown cat in solid Brown only. However, this breed does occur in both Chocolate and Lilac colors and all make fantastic pets. If your Havana Brown is not a show cat, it will require very little grooming. The cat will take care of bathing itself and regular grooming with a rubber brush helps remove any stray hairs. The quiet and gentle Havana Brown adores being lavished with love and attention. It has a soft voice, but can project when offended or feeling particularly needy. This loving and sociable feline is very tactile, using his paws to touch or caress his human and to investigate things by poking and petting them with a delicate touch. These little imps have even been known to use a “hurt paw" technique just to get sympathy! Playful, athletic and a real people lover, this cat makes an entertaining and excellent companion. 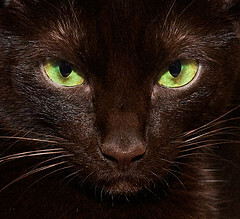 The Havana Brown is unique in the feline world because of two very distinctive features. The first is a rich, dark chocolate to mahogany-brown coat. The Havana’s medium short coat has a feel and texture comparable to a mink, and the brown color should be sound to the roots. The other unique feature is the Havana’s head, which is longer than it is wide and sports a broad, prominent nose. Whiskers are the same brown as the coat. The cat's medium-sized body is muscular and it is surprisingly heavy for its size. Green eyes are the standard for this breed. Forward tilted ears convey this breed’s natural curiosity and intelligence. 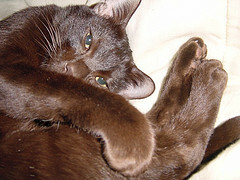 The Havana Brown cat has a sweet, endearing manner and a loves to play. They will often follow their human around like a puppy. Naturally curious, and not at all a “scaredy cat”, the Havana Brown will fearlessly investigate anything and everything. This breed tends to develop strong bonds with their humans, often becoming particularly attached to one individual and being just a little possessive of them. Always loving and happy to play tag and other games well into old age, this is the perfect cat for people who have lots of love to share with an affectionate and intelligent feline companion.